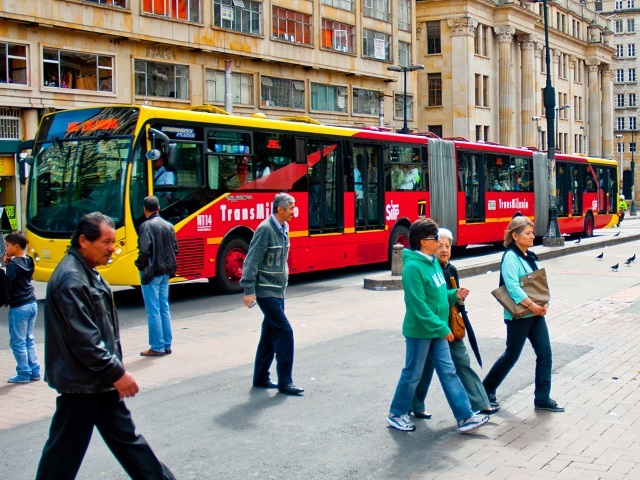 Bus rapid transit (BRT) systems, like Bogotá’s TransMilenio, experience greater levels of ridership if their stations are located in urban environments that are dense, compact, and connected to mixed-use areas and public spaces. Photo by City Clock Magazine/Flickr. There are currently 190 cities in the world using bus rapid transit (BRT) systems to serve the mobility needs of more than 31 million daily passengers. The BRT boom over the past 15 years has been a significant step toward achieving sustainable urban transport, particularly in rapidly growing cities. Understanding the factors that make BRT successful is critical for not only improving the cost-effectiveness of BRT, but also ensuring strong ridership, which influences on key performance variables like travel time, operational savings, road safety, and emissions. As a result, there’s been recent interest in assessing how the built environment—which includes factors like pedestrian infrastructure and density—affects ridership in different types of BRT corridors. However, little is known about the relationship between the built environment and BRT ridership, since existing studies have generally examined the impact of the built environment on transit ridership within metro and light rail systems. This leaves a serious gap in our understanding, as it’s often assumed that population density alone determines BRT ridership. New research looks to fill this gap by exploring how the built environment influences BRT ridership at the station level. Presented at Transforming Transportation 2015, this research suggests that a rich array of built environment factors affect BRT travel behavior. The study tested for associations between BRT ridership and built environment data around 120 BRT stations in seven Latin American cities, and concluded that the built environment plays a significant role explaining BRT ridership. Mixed land use and active transport infrastructure play an important but often overlooked role as well. An urban environment characterized by a strong presence of public facilities in combination with industrial-commercial developments mixed with some residential land uses could constitute a favorable environment for BRT. BRT lines that connect commuter destinations—like financial districts and universities—and dense, multi-family developments can benefit from policies supporting pedestrian-friendly public spaces and access to offices and businesses. The built environment can support historic centers if there is strong pedestrian infrastructure, connected public spaces, commercial land use, and access to public facilities. High-rise multifamily developments, in combination with commercial land uses and moderately high population densities can help make BRT successful. Stations that serve low-income areas and informal settlements see greater ridership when they offer amenities important to low-income residents, such as adequate pedestrian infrastructure, mixed land use, and accessible public facilities. The results of the study also suggest that BRT terminals could benefit in terms of ridership levels if they function as nodes of larger urban development projects, including high-rise and mixed land use developments that are connected with non-motorized transport infrastructure. This last point relates to a concept receiving increasing attention in urban planning circles: transit-oriented development (TOD). TOD is an approach to urban planning that prioritizes the role of transit for creating connected, compact, mixed-use cities. This study confirmed that BRT stations can expect a positive change in ridership if the built environment around BRT stations has these features. A diverse mixture of land uses—like tall, multi-family residences, commercial businesses, and offices concentrated around stations—has been shown to strengthen ridership, as well. Given that several cities are considering integrating TOD principles into the planning, implementation, and evaluation of their BRT stations, these insights will help substantiate the case for prioritizing transit-oriented development as a means to build more prosperous, sustainable cities. BRT was pioneered in Latin America, and the region has been refining and expanding its BRT systems for more than 40 years. Robust research on the influence of the built environment on ridership levels allows city leaders to make informed policy decisions about how to fund, develop, and manage BRT stations and the areas around them. 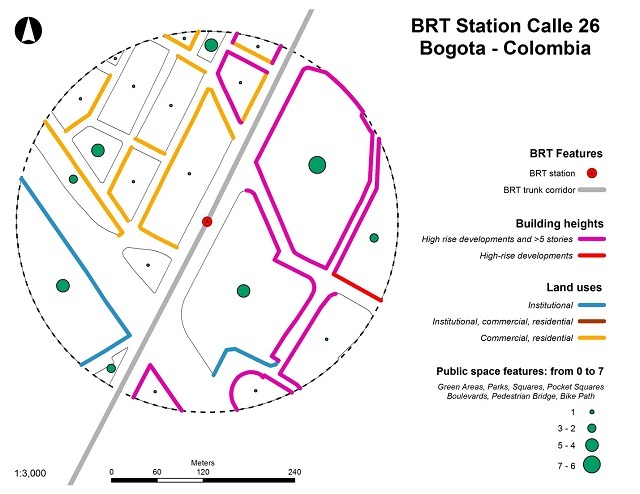 This study of 120 BRT stations in Latin America emphasizes the important role of station areas in strengthening ridership. In particular, local governments should consider not only the physical built environment features discussed here, but also how these elements can be combined to create more transit-oriented and pedestrian-friendly environments. By collecting data around current and future BRT stations, local governments could assess the changes on the built environment needed in order to make BRT systems more successful. In this manner, planners and designers should ensure that the areas surrounding BRT stations have compact, mixed-use development, high building heights, quality public spaces, and safe infrastructure for pedestrians and cyclists. Erik Vergel-Tovar is a 2014 Lee Schipper Memorial Scholar and Ph.D. Candidate in City and Regional Planning at the University of North Carolina Chapel-Hill. Download his working paper at the Lee Schipper Memorial Scholarship website here.